Grotte di Caglieron may easily turn out to be your new favourite place in the region of Veneto, Northern Italy. Especially if you love hiking, caves, waterfalls and… ahem, cheese! This is an area of beautiful nature where wooden walkways take you through a series of caves and waterfalls streaming down the rocky sides of a gorgeous gorge (you see what I did here?!). The hike then continues past two old watermills – the larger of them nowadays functions as a restaurant and the smaller one hosts cultural events. Finally, the path leads you through a tiny hamlet with a couple of stone houses and loops on itself bringing you back to your point of departure. The cherry on the cake of all this wild beauty, running water and stunning views is the fact that one of the caves along the way is used to mature cheese. Yes, they place slabs of cheese on wooden shelves lining up the bowels of the small cave and leave them there for three to four months. Thus a thick crust develops around each slab holding the cheese in its pungent embrace. Seeing it all – cheese, waterfalls and caves – makes you truly understand the meaning of the phrase ‘heaven on earth’! Yes, it’s true. In our stressful, energy-depleting world there are places that make you feel calm and happy again. And Grotte di Caglieron is like one of the best among them. If you want to see and experience Grotte di Caglieron for yourself, please, keep reading. I have provided lots of information below – from practical tips about parking and navigating the walkways to details about the history of the caves. What is Grotte di Caglieron and how to get there? Grotte di Caglieron is a series of caves running alongside a deep gorge cut by the Caglieron stream into steep limestone rocks. It is an area of beautiful nature which you can traverse on foot following sturdy wooden walkways. 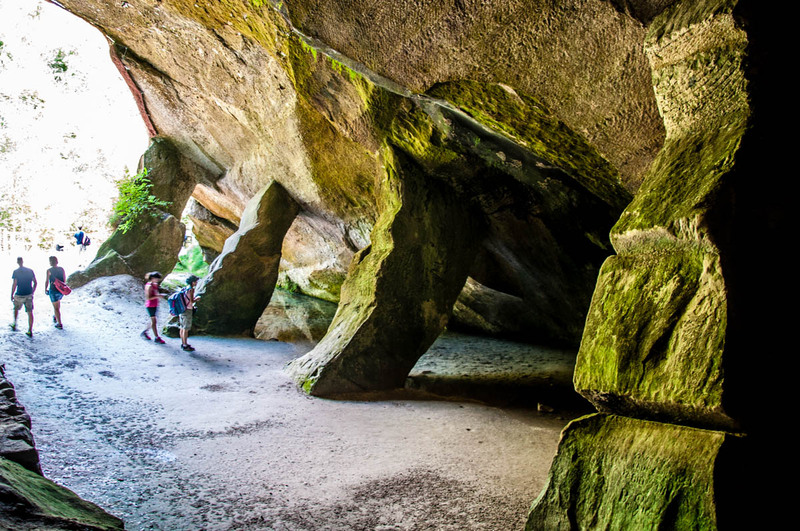 You will find Grotte di Caglieron in Breda – a hamlet of the small parish of Fregona in the province of Treviso. You can easily reach Breda by car from Jesolo, Padua, Treviso, Vicenza, and Venice. It is a nice and quick journey most of which is spent on the toll motorway. Once you reach Fregona, follow the instructions of your GPS to Breda. The road will slope down and (in the high season) you may see lots of cars parked alongside it. Keep driving to the bottom of the road. There, you will see a wide bridge with a car park on the other side of it. Depending on the month of the year and the weather, you may need to wait a bit for a parking space as Grotte di Caglieron is popular both with tourists and locals. 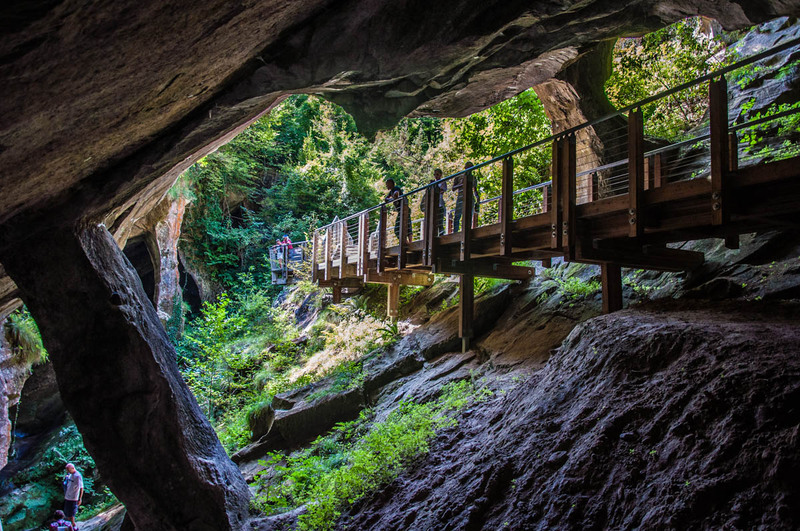 What to see in Grotte di Caglieron? Once you’ve parked your car, follow the trickle of people to the beginning of the hiking path. It’s easy! First, on the left-hand side of the entrance to the car park, you will see a set of stone steps leading up to a small cave. The Grotta della Madonna is a small chapel nestled in a tiny cave. Inside you will see a statue of the Virgin Mary with St. Bernadette surrounded by a myriad of lit candles. Outside, there are benches and a water fountain which is useful if you need to top up your water bottle. Go down the steps back to the entrance of the car park and then walk straight ahead from there following the wide pebbly path which takes you first past the bridge and then right underneath it. There you will see a bas-relief of St. Anthony the Great (in Italian: Sant’Antonio Abate). St. Anthony the Great (also known as the Father of all Monks) was a Christian monk from Egypt. He is often depicted with a pig at his feet. Some believe that this is because St. Anthony the Great spent several years of his life working as a swineherd. Others think that the pig is a symbol of all the temptations that the devil sent to the saint to test his faith and resolve. 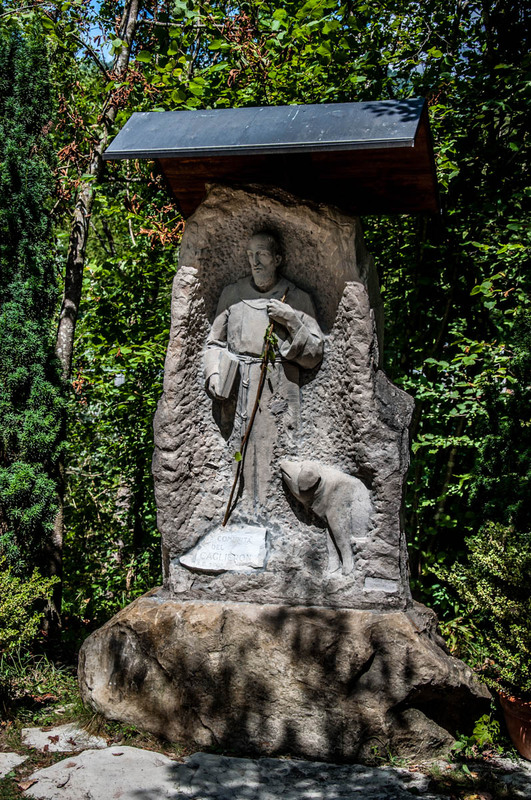 In the past, a statue of St. Anthony the Great stood at the beginning of the road which went above the Grotte di Caglieron to the watermill on the other side of the gorge. Traversing the road in a cart loaded with grains or flour was a dangerous enterprise due to the many precipices. It was believed that the statue of the saint protected the people and the animals on their perilous journey. The current bas-relief is a reminder of the past and expresses the gratitude of the local people to the saint. From this point onwards, the Grotte di Caglieron starts in earnest. You just need to follow the path and take all the beauty in. The sweet sound of running and dripping water will accompany you on your walk. Large billboards provide detailed information about the place, its history, its flora and fauna, as well as its geography. The Grotta dei Breda is the first cave you will see on the right-hand side as you start your exploration of the Grotte di Caglieron. It is a large, impressive cave with a dusty floor and huge stone pillars supporting its sandstone ceiling high above your head. Here is the right moment to tell you that the caves of Grotte di Caglieron are man-made. Starting back in the 16th century, the local people would extract the soft stone (called ‘piera dolza’ in the local dialect) and use it to create jambs, architraves and other architectural elements which can still be seen in the old buildings and houses in the area. The stone was carved in blocks following the natural 45-degree slant of its layers. Large chisels were used and if you look closely, you can still see the marks left by them on the walls of the quarries. The huge inclined pillars were left in place as the quarry was emptied of stone around them. Their function was to support the ceiling of the quarry so that it wouldn’t collapse. 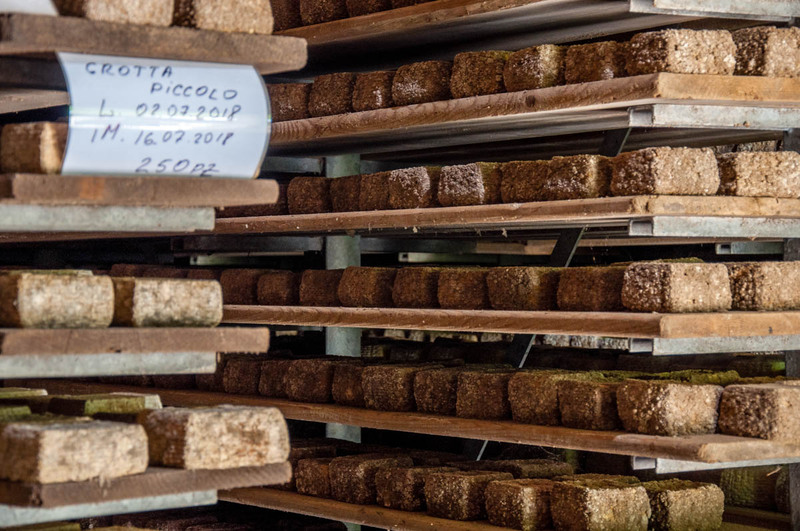 Just across from the Grotta dei Breda you will see the Grotta di San Lucio – a smaller cave where the cheese magic happens. 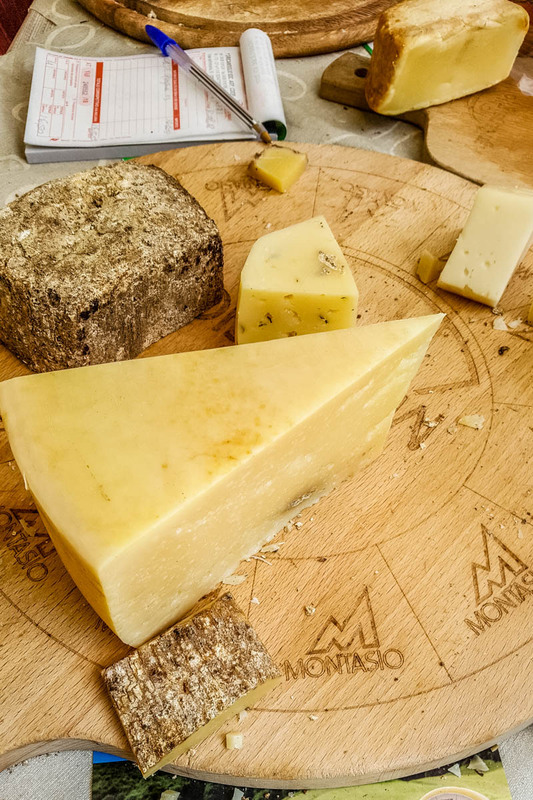 The Cheese Cave also known as the Cave of San Lucio is used for the ripening of cheese produced by a local dairy cooperative called Agricansiglio. 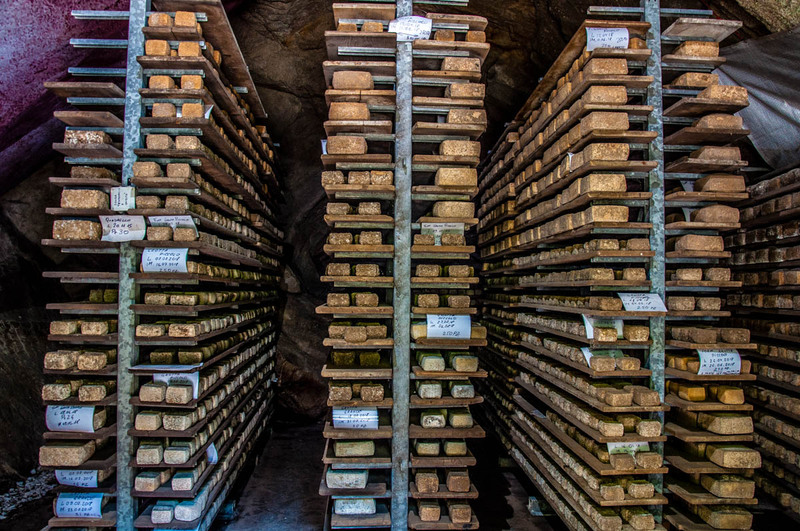 Slabs of raw milk cheese are neatly placed on numerous wooden shelves inside the cave and left there for three to four months to mature. A thick crust develops all around each cheese slab thus preserving it and helping it develop its flavour and taste. In the special microclimate of the cave, the cheese slabs end up looking just like a piece of sandstone. You can click on this link to learn more about the cheese and its properties. When we visited the Grotte di Caglieron, there was a cheese-selling stall in front of the Grotta di San Lucio. We sampled different cheeses made by Agricansiglio and, obviously, bought a slab of cheese that had matured in the cave. We paid about 9 euros for a slab of around 400 grams (if memory serves me well!). At home, we cut off the crust, carefully removing all traces of it. The cheese had a very nice creamy texture and unique taste. You can see how it looks stripped of its crust on the photo above. Definitely give it a try when you are visiting the Grotte di Caglieron. 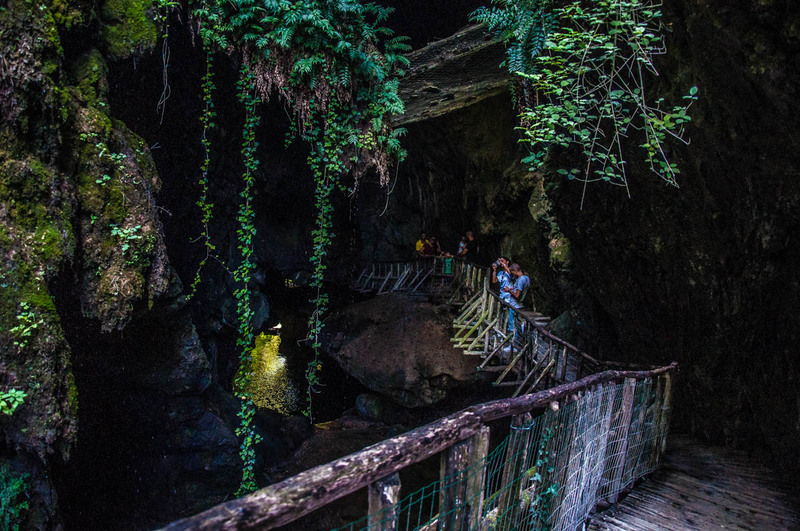 Then retrace your steps back to the Grotta dei Breda and follow the wooden walkway over the gorge of the Caglieron stream. 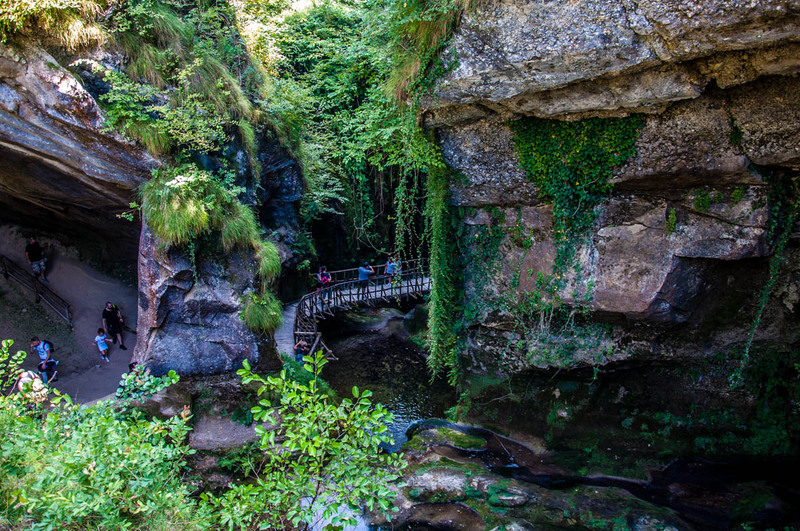 Following the wooden walkway over the gorge of the Caglieron stream is a beautiful experience. It sneaks in and out caves, it hangs above waterfalls and it gives you unique points of view over jets of gushing water. 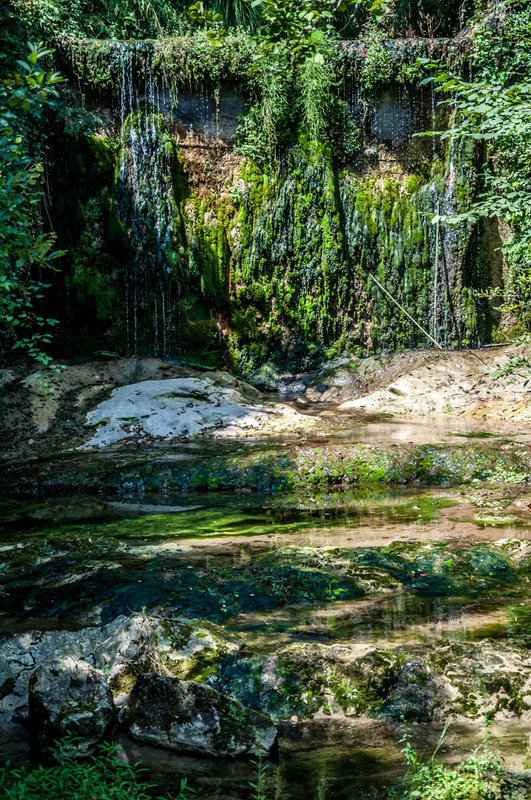 In the hot and sweaty Italian summer, it is a great pleasure to find yourself there, surrounded by the freshness of the water and the lush green vegetation. In the cold months, large icicles are formed giving the gorge a distinct winter wonderland look. Unfortunately, it doesn’t take long at all to traverse the wooden walkway from one end to the other. It’s so beautiful and inspiring that you feel like immediately turning back and retracing your steps. Yet, please, don’t do it. At certain points the walkway can be quite narrow and walking against the flow of people is inconvenient and uncomfortable. I am speaking from experience here, as I had to press myself flat against the wet rocky wall a couple of times while holding onto my child for dear life to let people going against the flow pass. Once you complete the wooden walkway part of the experience, you will find yourself in front of a large watermill. 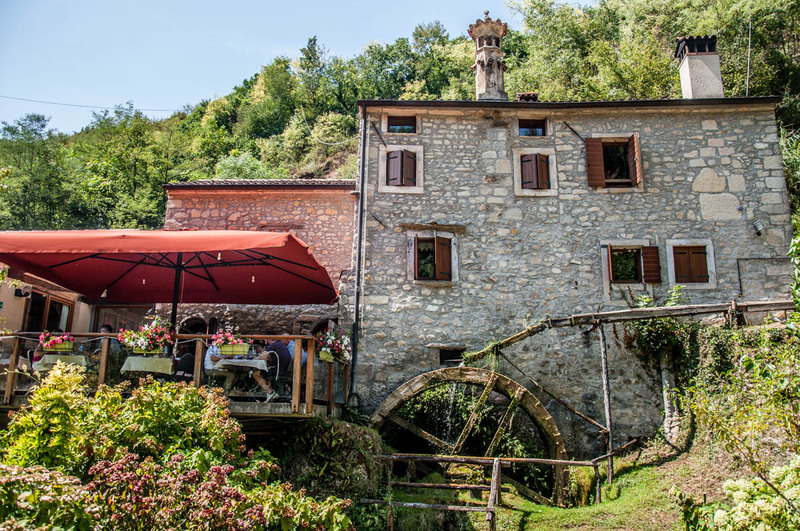 Known as the Antico Mulino (in English: the Ancient Mill), nowadays it functions as a restaurant. Yet, documents testify to its existence as far back as 1530. This mill was in use until 1947 attracting people from the local towns and villages to have their cereals ground there. A few more steps further down the road, you will find another, much smaller mill. Called Mulinetto del Caglieron (in English, literally the Small Mill of Caglieron), it is nowadays used for cultural events like the exhibition we saw when we were there. From this point onwards, the path loops on itself and starts ascending. Not much fun, if you ask me, especially when the day is hot and dusty. The landscape also is not as beautiful as the gorge but one way or another you need to return to your car, so you need to follow the path up and up the hill. A small grace here is seeing the tiny Borgo dello Scalpelino. The Borgo dello Scalpellino (in English: Stonecutter’s Hamlet) is so tiny that it has only two houses. They are very pretty though, plus there is an outside water fountain there for you to top up your water bottle. There are plans in place to turn the houses into a museum dedicated to the stonecutters who used to extract sandstone from the quarries of Grotte di Caglieron. From the hamlet, keep following the path and before you know it, you will complete the loop and find yourself by the bridge next to the car park. Don’t head back to your car just yet. Instead, cross the bridge and walk to the large Grotta di Santa Barbara on the other side of it. The Grotta di Santa Barbara is yet another former quarry that is part of the Grotte di Caglieron. Curiously enough, once all the stone was extracted, the cave was then used to grow mushrooms. Hence, in Italian it used to be known for some time as Fungaia – the mushroom patch. There are plans in place to turn the Grotta di Santa Barbara into a teaching and workshop space in the near future. 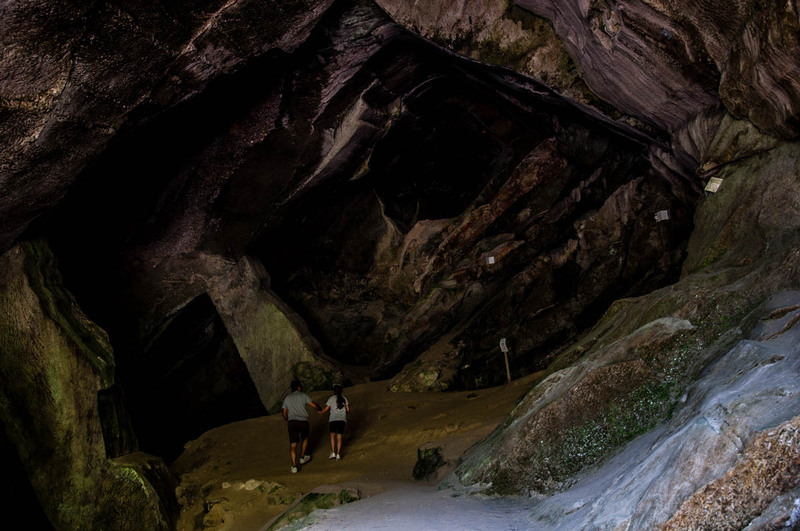 Once you have seen this cave, you can either continue up the road to the nearby Visitors’ Centre or simply walk back to your car. How long do I need at Grotte di Caglieron? You can do it all in as little as one hour. You will need to be quick and efficient but you can easily do it in sixty minutes. Put aside at least two hours if you want to take the beauty of the place in and just revel in the views of the gorgeous gorge (yes, I am doing it again!). If you bring a picnic with you or decide to have lunch at the restaurant in the ancient mill, then you can spend as long as you want there. When is the best time to visit the Grotte di Caglieron? You can visit the Grotte di Caglieron any time of the year. It is a free circular path accessible from sunrise to sunset. In summer it is a rather refreshing place to be (that’s it, the part that goes through the gorge itself). In winter, people say that at many points along the route the water turns to ice so that must be rather stunning to see. Enjoy your visit to the Grotte di Caglieron. It’s a beautiful and special place. One that long remains with you after the day of your visit. 1. Wear comfortable shoes with good grip. The wooden walkway can get wet at points and the path can be steep at places. You need to be able to keep your balance, especially if you are leading small children by the hand. 2. Buggies and strollers are not allowed. 3. Dogs must be on a lead. 4. Don’t leave the wooden walkways and the path. Especially to take photos and/or selfies. I saw a couple climbing up to some really dangerous spots and posing for pictures. Ask yourself if a picture is worth it a sudden slip. 5. Also, don’t lean over the railings. 6. It may be tempting, but don’t paddle, swim or dive in the water. 7. Don’t crowd the wooden walkways, walk in a single line on them and don’t go against the flow of people. 8. 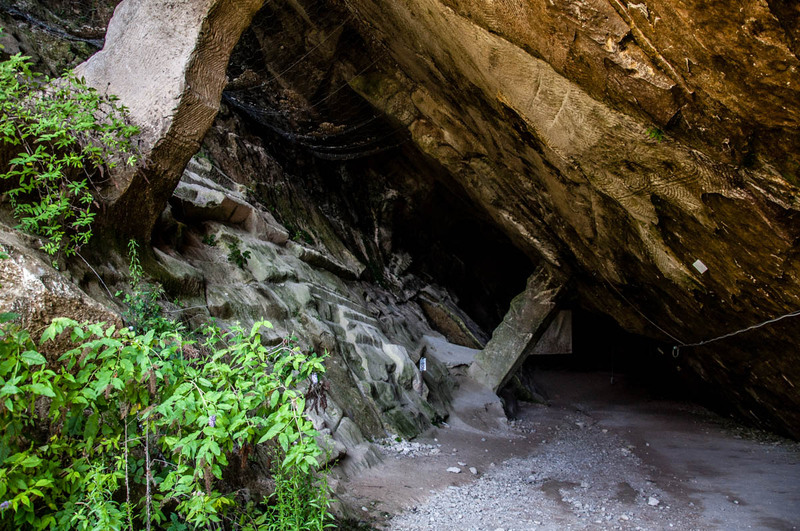 Check the official website of Grotte di Caglieron here for more information. 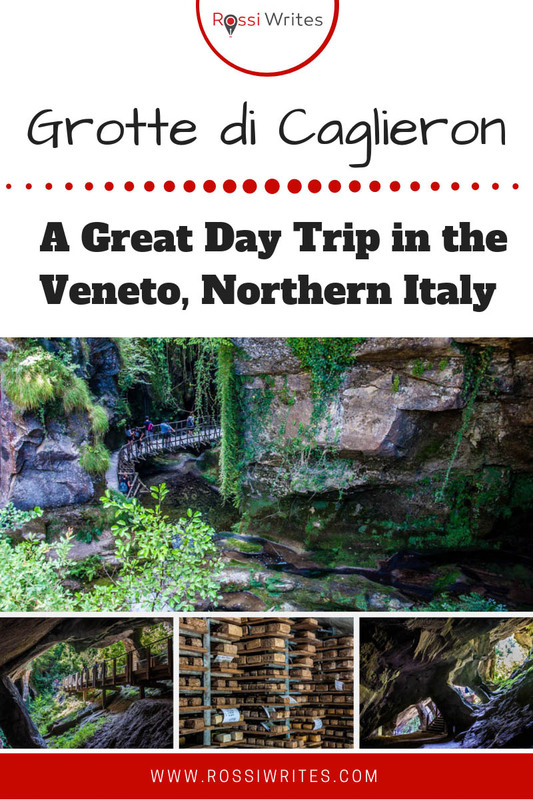 Where should I head to after visiting the Grotte di Caglieron? Serravalle (Vittorio Veneto) – a stunning medieval walled town. 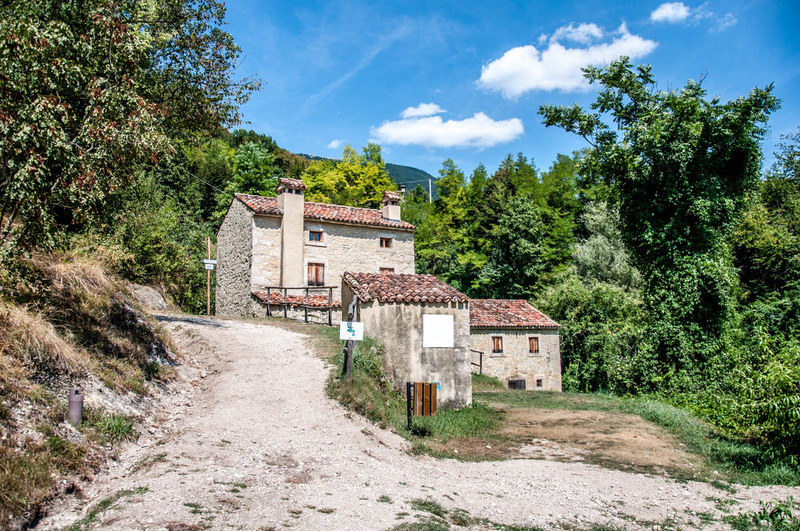 Cison di Valmarino and/or Follina and/or Mel – officially recognised as three of the most beautiful villages in Italy. Conegliano – a beautiful medieval town with a castle. Also, the birthplace of the renowned artist Cima di Conegliano. Santa Croce Lake – a beautiful lake. 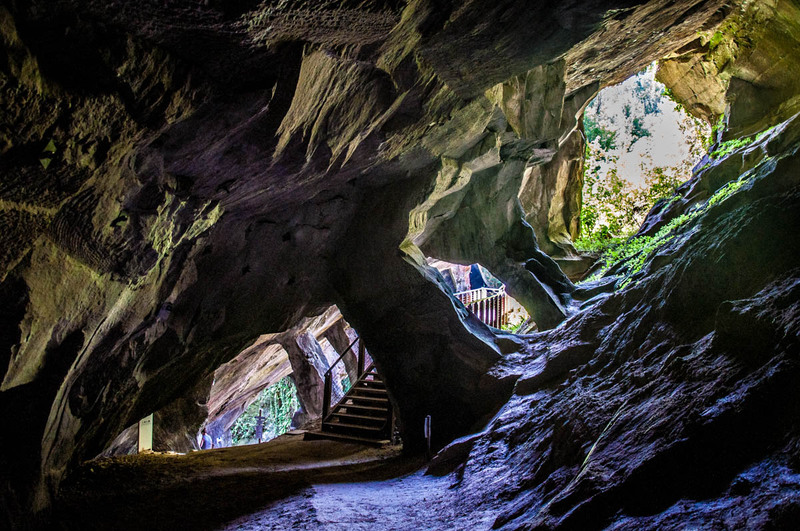 The Grotte di Caglieron is a stunning nature- and man-made sight in the Northern Italian region of Veneto. Easily accessible from the largest Venetian cities, like Jesolo, Padua, Treviso, Venice, and Vicenza, the sight is a great half-day or full-day trip. 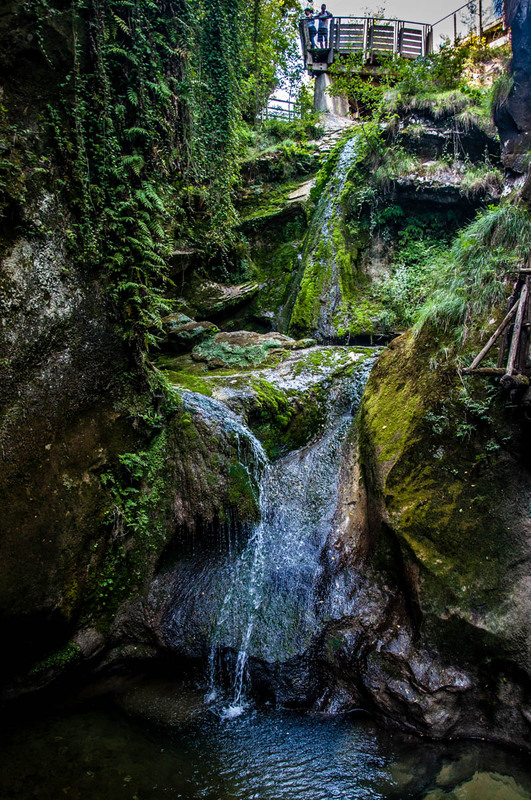 Put Grotte di Caglieron high on your bucket list if you love caves, waterfalls and cheese.